My friends at the Office of Information Technology needed a quick interface concept for an IPTV solution. This is the design I provided for reference as the project kicked off. The design was created for readability and clean navigability, and it integrated a new color family that I designed for use in OIT projects. I was excited to try and quickly address some of the issues that are common problems for channel guides. This is a feature image series I designed for a big data and information governance website recently. The series needed to feature users holding laptops or mobile devices and engaging with the data or the audience. This is a visual layout that I created for a wayfinding digital signage project. The client requested a horizontal layout that was simple and easy to navigate. High placement of the screens on the wall raised accessibility concerns, so I placed the navigational elements at the bottom of the design. 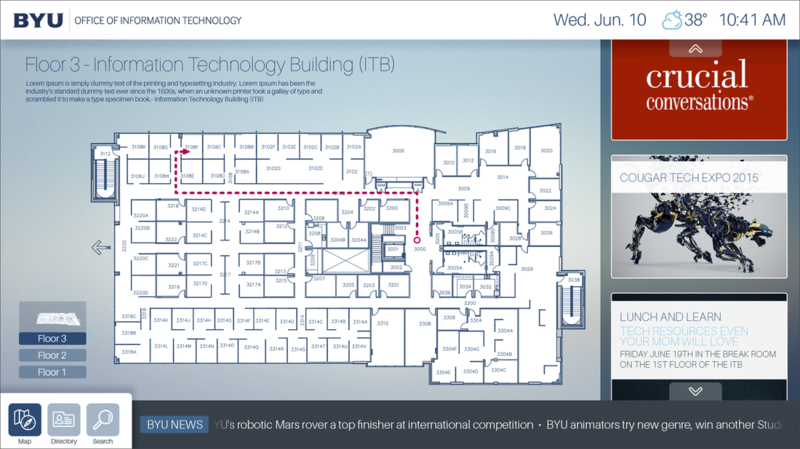 BYU's Office of Information Technology needed a quick website and marketing materials to promote the Cougar Tech Expo. I provided a responsive single-page scrolling website with custom images and illustrations for its features slider as well as a video gallery. 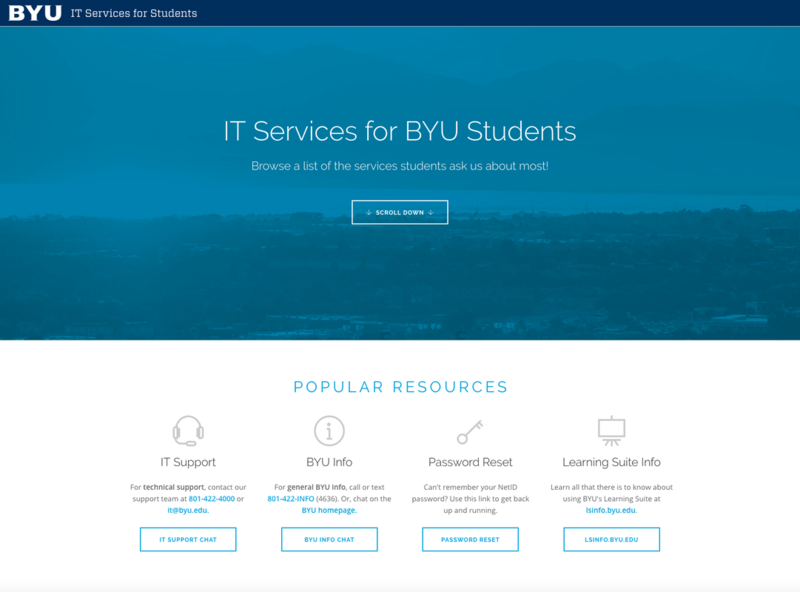 The Office of Information Technology needed a landing page to consolidate and deliver the tech resources that onboarding BYU students ask about most when they arrive at the university. It needed to incorporate video training, links, and promotional material. Of course, mobile responsiveness was crucial. That's why Bootstrap was a good framework for me to use to expedite the building process. The Office of Information Technology at BYU needed an interface for a room scheduling app they were developing. I produced a quick mockup based on their requirements, and they developed a rapid prototype based on my mockup.